What’s up with that blue chair? It’s early spring here in the Pacific Northwest and the weather is . . . changeable. Yesterday, which was Easter Sunday, I put the blue chair back in its accustomed place underneath wisteria blossoms that have yet to unfurl. I write in earnest now. I think of myself as a writer. A part of me wishes so much that I had headed down this road sooner, my earthly goods tied in a bandana and suspended from the end of a stick. I would have set off whistling (except I can’t whistle) and never looked back. The novel that’s been in my head for all these years — I’d have leaned into it and at least had a manuscript by now. I’d have been engaged in a writing practice that was meaningful and fulfilling, writing essays at least to myself. Perhaps I would have tackled memoir. I would certainly have had more time to read — classics, junk, the latest, whatever I wanted. Instead, I have most of a first draft, written over a ridiculous amount of time. But I do have that and I’m working consistently to move forward with it, too. I’m taking myself as I am. I am sitting in the blue chair in my tiny front yard. I’m there almost every day if the weather allows, just as I was last summer. It’s comfortable, it’s symbolic, and I love the view along my curved sidewalk and over the bronzy-red Japanese maple to the tall hemlock spruce trees beyond. It’s a sheltered spot. I can daydream there, and I do, looking up at the clouds, and the tree tops, and the blue sky. Eventually, I will turn to the book I’m reading, or to my notebook, grateful to have this spot that grounds me. This year, when fall comes and the days are shorter, cold and damp, I will miss my spring and summer days in the blue chair, but what it gives me, a specific place in which to read, write and think, will linger on. 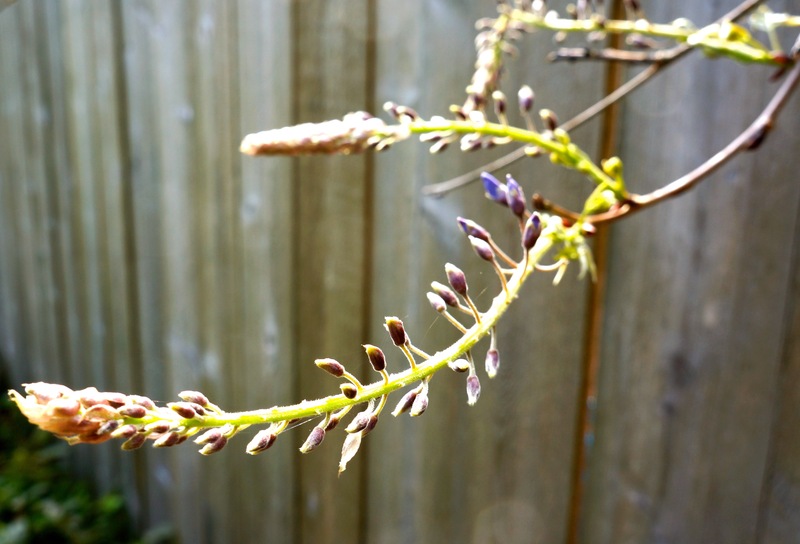 Categories: Inspiration, Pacific Northwest, Writing | Tags: Spring, Wisteria | Permalink. I hope you can fly that blue chair off to the land of imagination. There really is a right time for things. Before now you were busy and valued for your fine legal mind; now you can take your fine mind in another direction. Now is the right time, and the blue chair sounds like the right place.